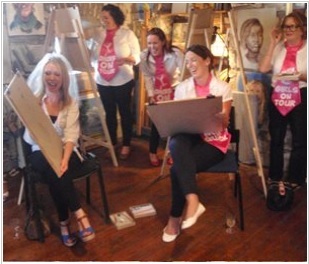 Treat her to the latest and most popular activity for Hen Parties – ‘Draw a Naked Guy‘ art class. This is a sophisticated, fun and exciting event and is a great alternative to just booking a ‘Stripper’. Here you will get to admire, scrutinize and stare in wonderment at the beauty of the human form – you will also learn how to draw various parts of his anatomy! The drawing session lasts for approximately 90 minutes. Wine can be brought in (or we can organise this for an additional charge). The tutor will explain the running order and will give a brief demonstration of materials and techniques. The party will then be introduced to the model, who will assume a number of classical poses, comprising profile, rear and full frontal. Help and guidance from the tutor will be on hand throughout the session. A group photo with the model can be taken, and Hens get to take their drawings home. Reduced rates for larger parties.